Click Here For The 5 Easy Steps! Purchase a Discovery Flight Today! Click Here. Flight School: Learn To Fly! One of the most experienced flight crews around! If you're like most people considering first-time flying lessons, you have probably dreamed of flying since you were a kid. I talk to people every day who have spent years longing to experience the thrill that comes from sitting in the pilot's seat, hands on the controls, the world dropping away and their horizons expanding with every passing moment. With our flight training program, learning to fly doesn't have to be a distant dream. You can do it... faster and more affordably than you probably think, with the right blend of motivation, equipment, and instruction. Are you ready to let your dream take flight? Your Dream Starts Today! Click here to download the free 'Learn to Fly' E-Book. Wow! AOPA's 2018 Distinguished Flight School! Air Trek North listed as a 2018 AOPA Distinguished Flight School! 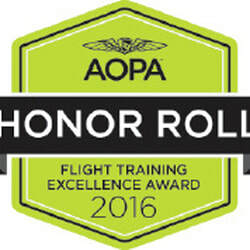 ​......And the only Flight School in Minnesota to be awarded this highly coveted award! Al Alwin, Air Trek North Flight Instructor, named to the 2018 AOPA's Distinguished Flight Instructor list. Only three CFI's named to this list in the State of Minnesota! .....and two are from Air Trek North! ​Thank you to all the students that took the AOPA Survey recognizing this darn good instructor!...and an FAA Gold Seal Instructor to boot! Congrats Instructor Paul Van Brunt! Paul Van Brunt, Air Trek North Flight Instructor, named to the 2016 AOPA's Flight Instructor Honor Roll!...and in 2018, AOPA'S Distinguished Instructor list! And an FAA Gold Seal Flight Instructor to boot! Thank you to all students that took the AOPA POLL & SURVEY recognizing this darn good instructor! Many of our flight instructors have been rated GOLD SEAL by the FAA, meaning they have the highest pass rate standards for their students. A GOLD SEAL flight instructor should be something you require of your flight school, at the very least so that the younger flight instructors have plenty of Mentors. We want our instructors to have a love of flying along with a tremendous desire to help others learn to fly. That's why Air Trek North has such an outstanding student satisfaction rating on their flight training curriculum! Congrats: Paul Van Brunt, Air Trek North Flight Instructor named Minnesota's 2013 Flight Instructor of the Year!